On the 26th (Sun), pause for some serene contemplation at Church of Sao Francisco de Assis, get engrossed in the history at Casa dos Contos, don't miss a visit to Centro Historico de Ouro Preto, then explore the world behind art at Museum of Betrayal, and finally pause for some serene contemplation at Basilica of Nossa Senhora do Pilar. To see reviews, ratings, maps, and more tourist information, refer to the Ouro Preto trip planner . Belo Horizonte to Ouro Preto is an approximately 2-hour combination of bus and taxi. You can also drive. In July, plan for daily highs up to 30°C, and evening lows to 20°C. Cap off your sightseeing on the 26th (Sun) early enough to travel to Fernando de Noronha. Explore hidden gems such as Praia do Cachorro and Conceicao Beach. You'll explore and learn at Projeto TAMAR Fernando de Noronha - Patrocínio PETROBRAS and Aulas de Energia - Espaco Usina Solar Fernando de Noronha. And it doesn't end there: enjoy the sand and surf at Praia do Sueste, enjoy breathtaking views from Forte Sao Pedro do Boldro, get outside with Baia dos Porcos, and stroll through Praia do Cacimba do Padre. To see maps, other places to visit, more things to do, and other tourist information, read our Fernando de Noronha day trip planner. Getting from Ouro Preto to Fernando de Noronha by combination of taxi, bus, and flight takes about 8.5 hours. The time zone difference moving from Brasilia Time (BRT) to Fernando de Noronha Time (FNT) is 1 hour. 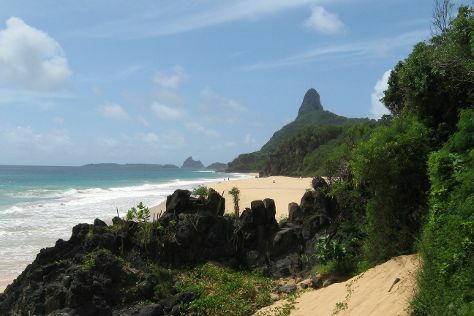 Expect somewhat warmer evenings in Fernando de Noronha when traveling from Ouro Preto in July, with lows around 28°C. Wrap up your sightseeing by early afternoon on the 29th (Wed) to allow enough time to travel to Rome. Galleria Borghese and Sistine Chapel will appeal to museum buffs. Get a sense of the local culture at Palatine Hill and Piazza Navona. The adventure continues: admire the striking features of Pantheon, take an unorthodox tour of Catacombe di San Callisto, delve into the distant past at Colosseum, and steep yourself in history at Roman Forum. To find reviews, ratings, photos, and more tourist information, read our Rome trip itinerary tool . Getting from Fernando de Noronha to Rome by flight takes about 17 hours. Other options: do a combination of flight and train. You'll lose 3 hours traveling from Fernando de Noronha to Rome due to the time zone difference. While traveling from Fernando de Noronha, expect a bit warmer days and slightly colder nights in Rome, ranging from highs of 37°C to lows of 24°C. 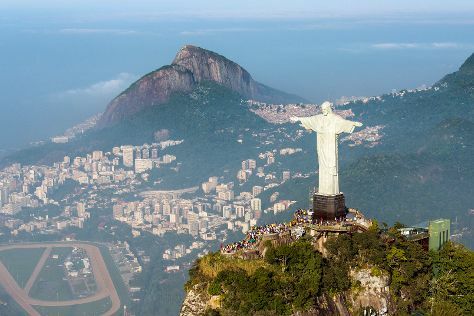 Wrap up your sightseeing on the 1st (Sat) to allow time to travel to Rio de Janeiro. On the 2nd (Sun), stroll through Copacabana Beach, enjoy the sand and surf at Pedra do Arpoador, then kick back and relax at Praia de Ipanema, and finally pause for some photo ops at Corcovado Christ the Redeemer. To find ratings, where to stay, maps, and other tourist information, use the Rio de Janeiro trip itinerary planner . You can fly from Rome to Rio de Janeiro in 15 hours. Alternatively, you can do a combination of train and flight. The time zone difference when traveling from Rome to Rio de Janeiro is minus 4 hours. When traveling from Rome in August, plan for a bit cooler days in Rio de Janeiro, with highs around 30°C, while nights are about the same with lows around 22°C. Finish up your sightseeing early on the 2nd (Sun) so you can travel back home.